You aren’t just a performer, you are an audience member…watching the people in front of you, waiting for reactions for gratification…scouring for signs of mirth, boredom, admiration, disappointment. Just as you become connected with characters on screen or stage, their reactions and feelings get absorbed into you. Your performance may become better and livelier with a hedonistic audience. With quiet, unresponsive viewers or those that chatter through a set you either become disheartened, detach yourself from the situation with shopping lists or find it the perfect challenge to get their attention. So to the girl and her mother who rolled their eyes, sneered and said ‘thank god’ when I announced my last track at a friend’s private performance just now…you are not the first, you will not be the last, but I’m not singing for you. I’m singing for myself, for the people listening and appreciating. For the children who don’t know the songs, but dance anyway. I sing so people can reminisce, to set the scene of an era and to keep them alive. I sing because I don’t have the guts to stop and tell you that I can hear every word and see every gesture. I sing because you can’t. 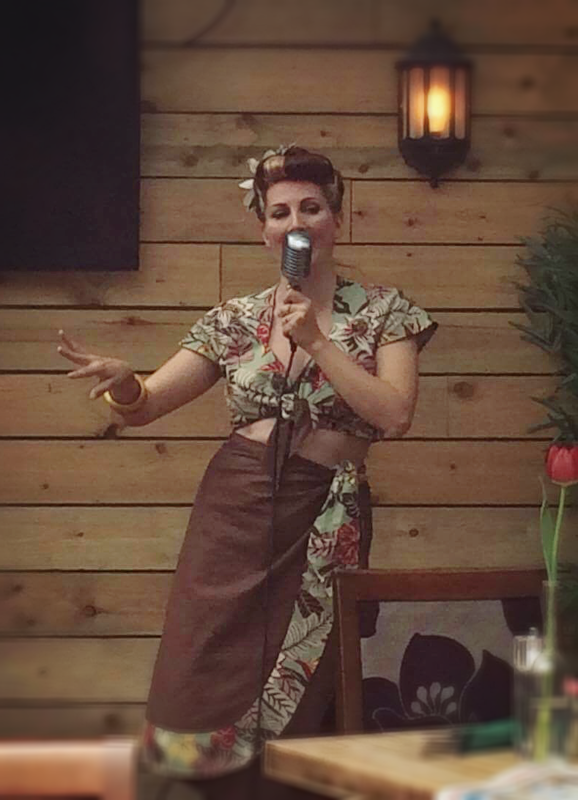 Posted in Day to Day, Events and Performances and tagged 1940's singer, 1950's singer, performer, performing, vintage entertainment, vintage singer. Bookmark the permalink. Today I did a set of soothing 40’s to 60’s songs at Leif Tearooms! I couldn’t wait to meet up with my friends and try the afternoon tea. Usually there is a piano player, but this time they got me on the mic! I was upset to hear that one of my friends was poorly, so couldn’t come along, but we managed to have a good time and wished her a speedy recovery. Time for another shameless plug… I was yet again wearing one of Time Machine’s amazing vintage reproduction outfits! The barkloth fabric is amazing and contrasts beautifully with the polkadot cotton of the skirt. You may have seen me wearing the trousers of this set at Battles for Victory last year! I also have some shorts too! I teamed this outfit with some vintage Bakelite and jade bangles that picked out the yellow and green beautifully. So back to Leif! 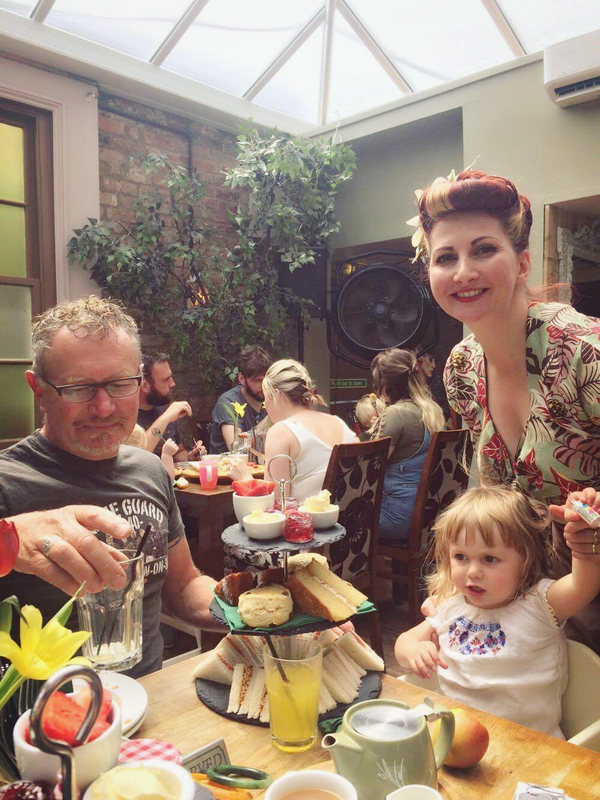 The afternoon tea is priced at £12.95 and is delicious and filling. You get to choose 2 Sandwich fillings and these come on a tiered slate cake stand with slabs of cake, really gorgeous scones (fresh not frozen! ), strawberries (guessing these are seasonal) and the obvious clotted cream and jam. Your tea is served in a loose leaf pot, so nice and fresh. I do prefer the little patisserie fruit tarts you usually get with afternoon teas as scones AND sponge cake can be a bit too heavy. I only managed the sandwiches, strawberries and scone, but it was a delight. Posted in Events and Performances and tagged afternoon tea, kitten von mew, kitty von mew, Leif, Leif Singer, Leif tearooms, lief, time machine, time machine reproduction vintage clothing, vintage singer. Bookmark the permalink. I meant to write this post LAST year, but just never got around to it. It was more of a chance to tell you about Kim Clark at Time Machine Vintage than anything! I wore her gorgeous summery dress to last year’s SVR WW2 event and Betsy wore the matching little playsuit! I had a few other things made by the talented lady, but could never find the perfect weather and location to don the all in one trouser playsuit. Low and behold, June came round again and so did Severn Valley Railway, with sunshine and warm weather! So I got to wear 2 Time Machine outfits at this fantastic event! Both have been sooooo comfy and far more enjoyable to walk around in than a suit and high heels. There is so much to see at the 40’s event and quite a bit of walking, so I wanted to be comfy but of the period. The linen jumpsuit is actually based on a 1930’s pattern, but Kim and I loved the styling and it was easy to create an early 40’s look with it too. I cannot wait to wear it on holiday with some yellow bakelite jewellery and a more 30’s twist! Kim has a real eye for vintage style fabrics (and sometimes gets her hands on 40’s and 50’s originals too!). It was fantastic to be back at Severn Valley. It had its ups and downs in past years, but it truly is a lovely event and a wonderful day out. Where else can you get on a steam train and stare out the window at soldiers, scenery, elephants and rhinos?! Pushchairs are not easy to get on and off the trains, so you may find yourself carrying your little people more than anything, but it is a perfect event for families. Some of the ‘vintage’ stalls were more 80’s does 40’s and polkadot 50’s dresses, but there were some good authentic stalls inside the Engine House (albeit flipping pricey!!!!). You may want to bring your own lunch and snacks as food is very pricey, but you can always have a cooked breakfast to start they day off at the station’s restaurant. Time Machine Vintage 1940’s reproduction summer dress and baby romper! Time Machine Vintage’s wonderful 1930’s outfit, twinned with an original 30’s hat and WW2 brooch. Shoes by Rocket Originals. I love the fact that Betsy has never actually been on a modern train yet! Only vintage trams and steam trains! 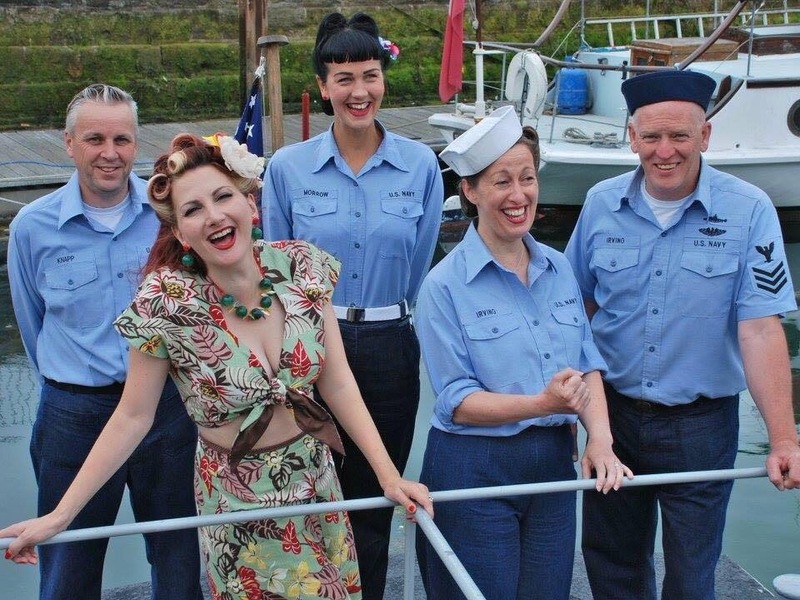 Posted in Day to Day, Events and Performances and tagged 1930's clothing, 1940's clothing, kim clark, kitten von mew, Severn Valley, Severn Valley 1940's Event, SVR, time machine vintage, vintage model, WW2 railway. Bookmark the permalink.